So, I've had this t-shirt in my closet for about six years. It was my favorite t-shirt my freshman year of college. You may have seen it before. It was the Low t-shirt that Kirsten Dunst's character sported with the red beanie in Elizabethtown. Anyway, my shirt does not even come close to fitting me anymore. But I have not been able to bring myself to throw it away. I'd order a new one, but the website doesn't seem to sell t-shirts anymore (unless I'm blind). I was thinking about making a t-shirt quilt, but who has the time for that? Definitely not me. But I do have time, I decided, to make a pillow. So I did. And it's pretty ugly. I love it anyway. I didn't do anything right with this pillow. 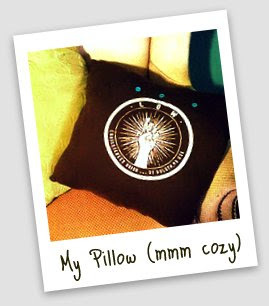 I didn't just get a pillow mold and use the shirt as a pillowcase, which would have been much more practical. I did, however, sew the shirt together with the wrong color thread (I don't know how to change the thread on my mama's sewing machine). And I probably sewed it in the wrong places. And there was that awkward inward curve where the arms were that, were I to sew in a straight line, would have cut off part of the graphic. So I used the back side of the shirt as an extension and then tried to make the front of the pillow look like an upside down envelope. This all sounds pretty convoluted, right? Well, it is. Then, in an attempt to make the pillow look a little cuter (failure) I added a few blue buttons. Have a look. Don't be afraid to chuckle, I know it's no masterpiece. My mother would probably be ashamed of seamstressy skills (or lack thereof). And, of course, since sharing is caring, I'll leave you with my favorite Low song, just so you understand why I couldn't get rid of this shirt. They're awesome. And this song is beautifully creepy.